It was a talk intended for a general audience. Well, what was assumed to be a general audience. Not many doctors attend the monthly meeting of NAMI Johnson County. But some people in the room know a lot more about the brain, what goes wrong, why, what can be done and what really works than the average viewer of those Zoloft ads on TV. We have to. We have come to understand that our lives depend on it. So when the new director of the psychiatry department explained it all, some of us caught the nuances, and squirmed in our seats. The squirming turned into a question, What is recovery? The answer turned into more squirming, and then a graphic, followed by long conversations, and eventually a power point presentation, Recovery: Rewiring the Brain, to be presented for Mental Illness Awareness Week, second week in October, Coralville, Iowa. Bottom line, there are different understandings of that word. If we are going to cooperate across disciplines, for example, medical departments and advocacy organizations, then we have to develop a common vocabulary. We have to understand how each other uses that word, even if our own agendas continue to define recovery differently. Here is the graphic the speaker used to describe what goes wrong in the brain and why and what can be done and the direction of the department's research for the foreseeable future. I love graphics. I love that I finally figured out how to get this one out of my power point program and into my blog program. But I go back and forth between being a lover of graphics (and my ability to create them) and a narrative thinker. When I communicate, I tend to move into narrative mode. So the graphic became a story. Meanwhile, my brain is near to breaking from the effort of this power point. And I have revisions to make if I want to save that slide with the snake... So I will be scavenging it over the next few weeks for Prozac Monologues. Here now is that graphic in narrative form, a story about a broken brain, and what the doctor thinks can be done. So let’s say you’ve got a broken brain. You take it to the doctor – maybe it’s your brain, maybe somebody you love. You might ask the doctor, What the heck happened here? Personally, I use a different word than Heck. Maybe the doctor tells you a story that explains how this brain got broken, and how it can be fixed. Maybe not. Some doctors skip this part and go straight to the meds. Each of our parents contributed to the mix, and between them, it’s the roll of the dice what comes out. There’s a lot of research nowadays in how certain genes cause the brain to dysfunction: lack of balance in neurotransmitters, too many, or not enough receptors, difficulty regulating things like the stress cycle or the sleep cycle. Sometimes our parents don’t have anything to do with it, after all. Recent research in schizophrenia indicates that spontaneous mutations in crucial spots on our genes may be what really tells the story. I understand that Dr. Potash wants to make UIHC a major player in this kind of research. But there’s a twist in this plot. Even identical twins, people who start out with the exact same genetic profile, don’t necessarily come down with the same diseases. 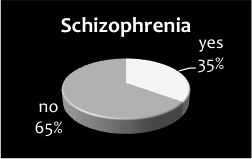 If one sibling has schizophrenia, the other identical twin has only a 35% chance of also having schizophrenia. Two out of three times, the other will dodge the bullet. Major depression, there is 60% chance if one has it, so does the other. But still, 40% will not. 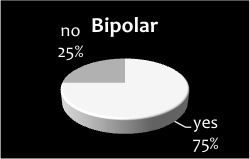 Bipolar seems to have the greatest genetic component, with a 75% chance, if one, then the other, as well. 25% chance only one. These are identical twins. The numbers are lower if you’re just sibs. Everybody has a story. The story makes a difference, because as it turns out, these genes don't just hand you your future. They have to be turned on first. What happens to you -- maybe before you are born, but also well into those wasted years -- is the switch. For better or worse, either way. In the medical model, the genes, turned for worse, cause a particular brain pathology. This pathology produces symptoms. The symptoms are the evidence of what the pathology is. The car mechanic down the street looks under the hood. The psychiatrist operates more like Tom and Ray, those Car Talk guys. S/he goes by what is reported. That's when we get to the diagnosis. A diagnosis is what you call a set of symptoms. It is assumed that a certain set of symptoms indicates a certain neuropathology, something that isn’t working right that causes the symptoms, like hearing voices, or racing thoughts, or insomnia. Each diagnosis has its own typical snapshot of symptoms, with variations, all described in the Bible of Psychiatry, known as the DSM. I won't say anything about what that's worth right now. It's what we've got. So what happens next? The patient receives a medication recommended for that diagnosis, because research or experience or hope suggests the chemicals will address that particular neuropathology, and thus relieve the symptoms. Now we have come to the cliff-hanger. What happens when you pop that pill? We hit pause and say, See you next week... Cut to commercial. graphic created by Willa Goodfellow, sourced from James Potash, M.D.